The first event was at the Hershey Centre in Mississauga, Ontario back in 2002. Team Canada, comprised of NLL superstars including Gary Gait, John Tavares, Colin Doyle, John Grant, Jim Veltman, and Bob Watson was expected to win easily but Team USA dominated the game and they won easily, 21-16. I don’t remember for sure but I have a feeling the game wasn’t even as close as the score might indicate. I only remember two things about that game: (1) Team Canada was a collection of great players but Team USA played as a team, and (2) Gary Gait and John Tavares pulled off the hidden-ball trick. From my seat I could see Gait toss the ball up and catch it again while JT ran behind him. The defenders and goalie thought he’d given it to Tavares so they all watched him as he looped up near the far boards. Meanwhile, Gait simply walked towards the net until he had a clear shot and scored. Awesome. I don’t remember if the game was planned as an annual event, or bi-annual, or just a one-off. Another Heritage Cup game was played in Denver two years later, and Team Canada got revenge on the US by winning 17-8. But after that 2004 game… some things that should not have been forgotten were lost. In 2013, the Heritage Cup was resurrected with a game in Montreal. This one featured Team Canada vs. the Iroquois Nationals, a team that many thought should have been involved in the first two Heritage Cup games as well. We all know that lacrosse comes from the North American indigenous people – you might say it’s a huge part of their heritage. In the lone Heritage Cup non-blowout, Team Canada won the game by a single goal, 12-11. Another long gap, this time four years, elapsed before this year’s game in Hamilton, which was announced back in the summer. It was announced at that time that there will be another game in Hamilton next year as well. Anyway, onto the 2017 game, which started off with a US goal. The game was tied at one and then two before Canada started to pull away. I believe their lead was something like 4-2 or 5-2 after one quarter. It wasn’t until the second where they really put things together and took over the game. Curtis Dickson was classic Curtis Dickson, scoring from everywhere. He put one in on a dive from behind the net while another was a laser to the top near corner. His fourth goal was an amazing display of skill as he fought off a defender and then snuck underneath his arm (this is why the swim move is not often used by defenders), faked the goalie two or three times, and then scored over the goalie’s shoulder. The offensive side for Canada was strong overall. I was going to list the players that I thought had good games, but it ended up being pretty much all of them: Matthews, Hall, Dickson, Dawson, Evans, Dhane Smith, Benesch, Leblanc. Jordan MacIntosh was everywhere, as he usually is, and the defense was tight though not as physical as I might have expected. In fact, the whole game wasn’t as physical as I expected. There were a few moments at the beginning of the second half that approached “chippy” but it didn’t last long. When putting the Heritage Cup team together, the Canadians simply went with their 2015 WILC team (with minor changes for injured players), so some guys like Evan Kirk and Corey Small weren’t on this team because they weren’t on that team. (Though why a guy like Rhys Duch wasn’t on either team is a mystery, unless he declined.) If they had gone through the “normal” decision-making process this past summer, it’s likely that Brandon Miller wouldn’t have made the team; they probably would have gone with Kirk or Nick Rose instead of Miller. But Team Canada’s laziness paid off for Miller who not only made the team but got the start, and he certainly made the most of it. Miller was seeing the ball well all night, making all the stops he was supposed to and a few he wasn’t. The fake-low-shoot-high shots consistently went off his shoulder, and more than once he slid across the net, correctly anticipating the quickstick. Miller was named Team Canada MVP and while Dickson deserved consideration as well, I thought Miller was the right choice. I’m afraid I can’t give much analysis on the US team because I don’t know those guys as well by sight, and the Heritage Cup organizers committed the unforgivable sin of not having players’ names on their jerseys. When you’re trying to showcase the best players in the world, you need to allow people to find out who they are without having to rely on announcers to tell us everything. Yeah, that was a great goal by Dickson but who set that solid pick for him? Maybe the announcers will mention it and maybe they won’t, but if you’re in the arena, you don’t even get that option. I was really looking forward to watching field lacrosse gods Rob Pannell and Paul Rabil playing indoors. Rabil, of course, has played in the NLL but not since 2013. But I wouldn’t recognize Rob Pannell if I fell over him and obviously the helmets make it even harder. So I couldn’t really watch Pannell and Rabil because I had no idea who they were. Now, part of that is my own fault because I didn’t pick up one of the little roster cards that were floating around the arena, but I shouldn’t have had to. Anyway, I thought the American team played pretty decent defense most of the time, but you can only do so much against Matthews, Dickson, Evans, and the rest of the guys I listed above. 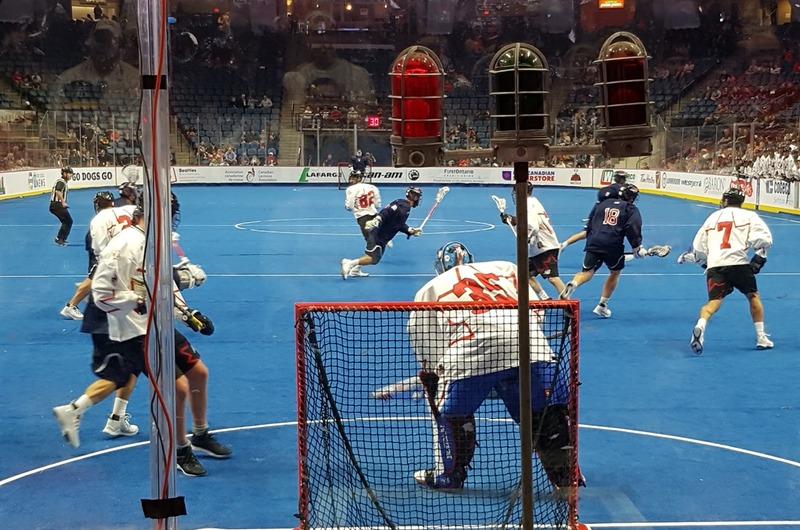 The American box lacrosse team has been known for having goaltender issues (i.e. not having very many of them) for a decade or more. They had three goalies on their roster, none of whom I’d heard of (if you don’t count American kid Brandon Miller who I’d only heard of because of his name), but I thought they played pretty well. Again, you can only do so much against the guys they were facing but there were some pretty good saves made by these guys, and given NLL expansion in Philly and San Diego, I wonder if we’ll see their names on NLL practice rosters in an upcoming season. The American offense seemed disjointed much of the time, with passes going nowhere and some miscommunication here and there. There were times where someone would try a quickstick pass except nobody was there to receive it, or a give and go turned into just a give. Before the game, there was an exhibition game between the Team Canada and Team Haudenosaunee U17s. The game was chopped up; they played the first two quarters, then the Heritage Cup teams came out for a shootaround and warmup, then the U17s came back to play the third quarter, and then they played the fourth quarter during halftime of the Heritage Cup game. It was quite an entertaining game, and Team Canada won 25-7. One odd thing I noticed – when Team Haudenosaunee scored, their goalie (#99) ran out to about halfway between the crease and the restraining line, tapped the floor with his stick, then walked back to the crease. I don’t know if it was something they always do, or just this guy, or if it was something meaningful or just a habit. The location was perfect for me since my home in Waterdown is about ten km from the FirstOntario Centre (formerly Copps Coliseum). More games in Hamilton would be great for me but it seems that Hamilton is just not a lacrosse town. The Ontario Raiders were only here for one year and got meh attendance, and then the Hamilton Nationals were here for a couple of years, also with meh attendance. I don’t have the attendance number for this game but… meh. Both sides of the arena seemed pretty full and one end as well, but the corners were empty, the other end was mostly empty, and the upper bowl was closed. I’m guessing maybe 4,500 people were there – and for the last couple of months, you could buy 2-for-1 tickets. I saw a lot of ads online for it but that could be because I had already bought tickets and… Google knows things. I have no idea if other people saw lots of ads, or any at all. I also have no idea if there were ads in the local paper or on local radio but I saw no billboards around town. Next year’s Heritage Cup will be in Hamilton again so we’ll see if they advertise it more. Shawn Evans must have tried the hidden ball trick at least four times – twice he dropped the ball after faking the pass, and the other times the guy he passed it to dropped it. Blue carpet! I love it! I was curious which rules they were following. NLL? MSL/WLA (who I think play by the same rules)? CLA? US Boxla? Some hybrid of all of them? I didn’t notice anything different from the NLL but there could have been some subtle differences. A guy sitting next to me saw me taking notes and asked if I was a sportswriter. Hey buddy, if you’re reading this, this is what I meant by “well, sort of”. A little girl with a powerful voice sang the US and Canadian national anthems, and then a bunch of us sat down. There was another announcement over the PA but I could barely hear the announcements (all game long, actually) so I don’t know what was said. Shortly thereafter, we heard another song being played, and realized it was the Haudenosaunee anthem so we all immediately stood up again. If anyone saw a bunch of people near one of the ends sitting during part of that anthem, it was completely unintentional and for my part, I sincerely apologize. Kudos to the organizers for playing all three anthems. There was a short tribute to Gord Downie before the game. But rather than have a moment of silence, they had a moment of applause – they asked everyone to yell, clap, sing, or just make noise in celebration of Gord’s life and music. The sound was deafening and the players were clapping and banging sticks on the wall as well. Nice touch.